The constellation Cygnus. Roll mouse over to see labels. Cygnus is a large and easily recognisable constellation in the northern summer sky. Its brightest star, Deneb forms one vertex of the Summer Triangle asterism. Visually, Cygnus appears as a ‘T’-shaped grouping of stars, with a fainter star Albireo (β¹-Cyg) making the T into a cross. For this reason, the asterism is sometimes known as the Northern Cross. The Milky Way passes through the middle of the cross, littering it with some of the richest star fields in the northern sky. Among these are twenty open clusters of tenth magnitude or brighter. A pair of binoculars are quite sufficient to bring hundreds of stars into view. 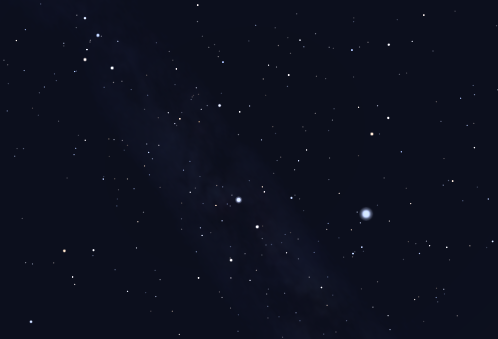 The star Albireo (β¹-Cyg) is particularly often observed, as it is a binary whose two components have two strongly contrasting colors – one red and the other blue. The name ‘Cygnus’ is Latin for ‘swan’, though accounts vary as to the swan's identity. In one popular story, Cygnus is the god Zeus in disguise, pursuing one of his many love interests – perhaps Nemesis or Leda, mother of Helen of Troy. Cygnus contains the following Messier objects: M29, M39. Cygnus contains the following Caldwell objects: C12, C15, C19, C20, C27, C33, C34. 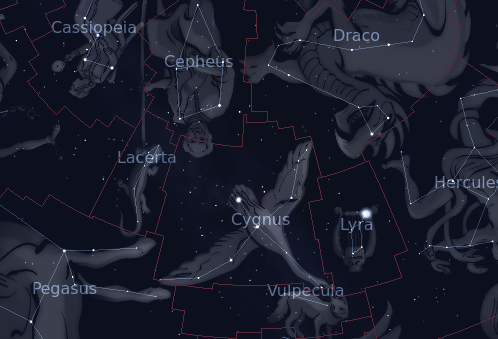 The following constellations neighbor Cygnus: Cepheus, Draco, Lacerta, Lyra, Pegasus, Vulpecula.